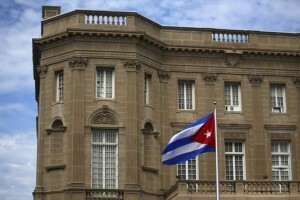 WASHINGTON - The United States has expelled 15 Cuban diplomats over Havana’s failure to protect American diplomats from mysterious sonic attacks. Yesterday, four days after warning American citizens not to travel to Cuba and ordering the departure of nonessential employees from the US Embassy in Havana along with their families, the Department of State informed the Cuban government that it was ordering the departure of the officials from the embassy in Washington, D.C. The Cuban diplomats have seven days to leave the country. “The decision was made due to Cuba’s failure to take appropriate steps to protect our diplomats in accordance with its obligations under the Vienna Convention. This order will ensure equity in our respective diplomatic operations,” US Secretary of State Rex Tillerson said in a statement yesterday. During the summer, at least 21 employees at the US Embassy in Havana reported a range of symptoms including hearing loss, dizziness, headaches, fatigue, cognitive issues and difficulty sleeping. Sonic attacks – the use of extremely high-power sound waves that can disrupt or destroy the eardrums of a target and cause severe pain or disorientation – have been blamed, but neither the US nor Cuba have been able to confirm that or identify a source. Cuba’s Foreign Minister Bruno Rodriguez said the expulsion of the Cuban diplomats was unjustified, and the US had been hasty in its decision. Despite the recent developments, Tillerson said the Donald Trump administration continues to maintain diplomatic relations with Cuba, “and will continue to cooperate with Cuba as we pursue the investigation into the attacks”.